Baby, it’s cold outside! Are you one of the unfortunates who suffered through the recent polar vortex? Or perhaps you are, like me, a weather wussy who lives in warm climate but is still always chilly? Good news, my cold friends! 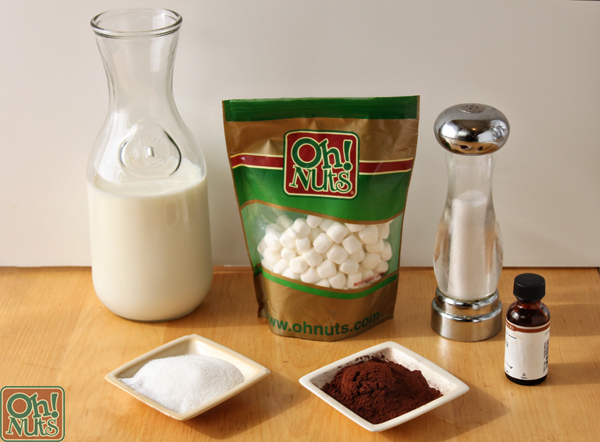 I have the perfect hot chocolate recipe to warm you right up. No longer will you fear cold weather reports and future snowstorms! 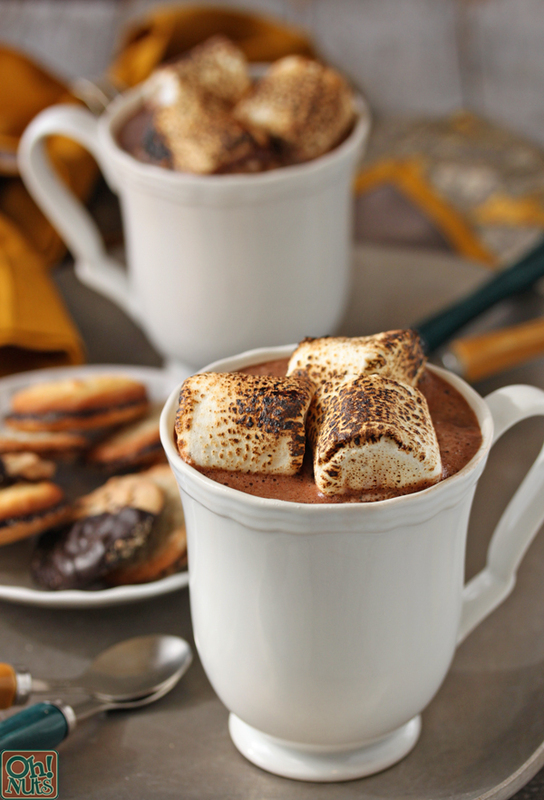 In fact, you’ll hope for bad weather, just so you’ll have an excuse to make this Toasted Marshmallow Hot Chocolate. Toasted Marshmallow Hot Chocolate isn’t just plain hot chocolate with toasted marshmallows on top. (Don’t insult me–that’s boring!) Instead, it’s a creamy homemade hot chocolate with toasted marshmallows dissolved right into the drink itself. Every warm slurp gives you the rich flavor of chocolate mixed with the deep notes of caramelized, vanilla-scented marshmallows. It’s not an overpowering flavor, and don’t worry, it doesn’t taste at all charred, burned, or campfire-esque. In fact, if you served it to your friends without telling them what it was, they might not be able to pinpoint the flavor–they’ll just tell you it’s one of the best mugs of chocolate they’ve ever had! Cover a small baking sheet with foil, and spray it with nonstick cooking spray. Spread the marshmallows out on the sheet in an even layer. If you have a kitchen torch, carefully torch the marshmallows until they’re evenly browned, without too much charring along the edges. (Some black spots are okay, but you don’t want them to be completely blackened.) 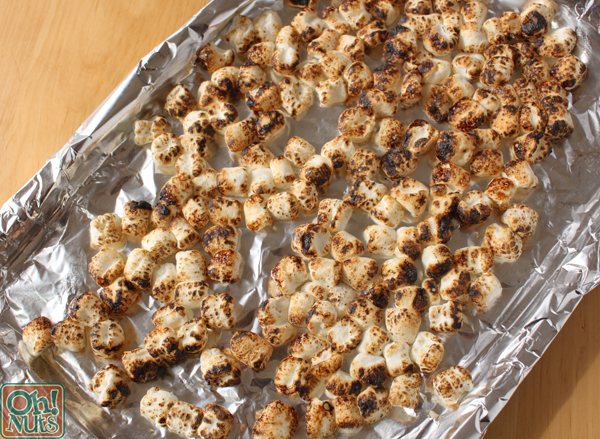 If you don’t have a kitchen torch, turn on your oven broiler and place the tray of marshmallows on a rack about 6 inches beneath the broiler. Broil for 30-90 seconds, watching them carefully as they toast. The exact time needed will depend on your oven, and the marshmallows can go from “perfectly toasted” to “charred cinders” in the space of just a few seconds, so stay close and remove them as soon as they’re ready! 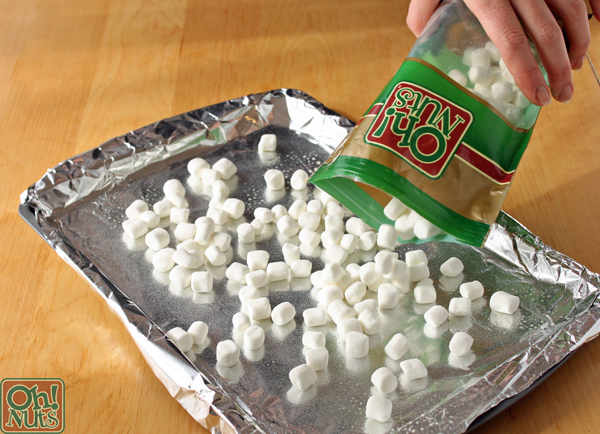 Allow the marshmallows to cool briefly on the baking sheet. 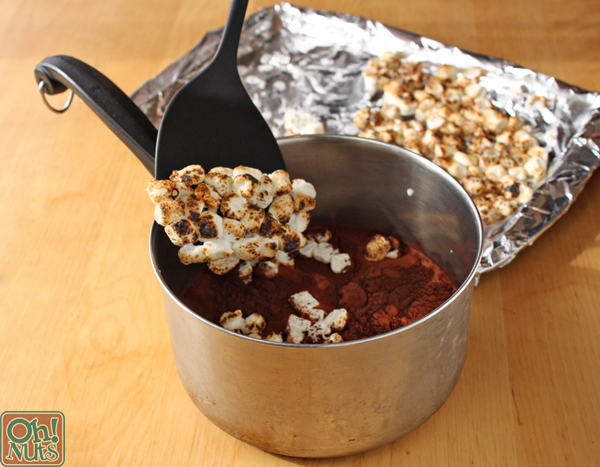 Combine the milk, cocoa powder, sugar, toasted marshmallows, vanilla, and salt in a medium saucepan. Now’s a good time to note that all of the chocolate flavor in the recipe comes from a few spoonfuls of cocoa powder, so please use the best quality cocoa powder you can find. This is not the time to skimp and use the cheap stuff! If it doesn’t have a rich chocolate smell when you open it, or have a strong chocolate taste when you taste a bit on your finger, then it probably won’t give your drink a great chocolate flavor, either. 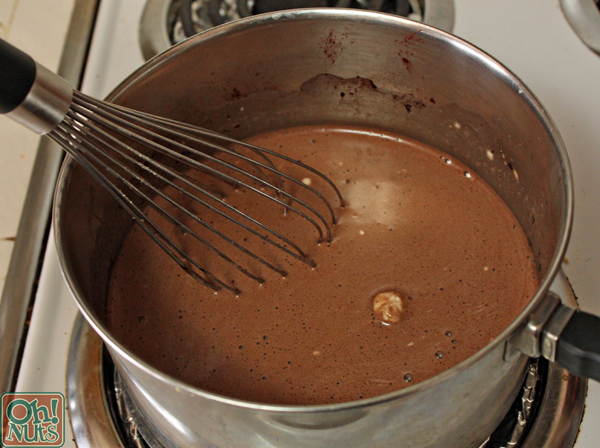 Place the pan with all the cocoa ingredients over medium heat, and whisk occasionally as the mixture heats up, so that the milk won’t scorch on the bottom of the pan. Continue to whisk and heat the drink until it is near simmering and the marshmallows are completely dissolved. If you didn’t have many black areas on the toasted marshmallows, your cocoa should be ready to drink. If you did have a lot of charred areas, you may notice a few dark specks in the cocoa. These don’t impact the taste, but if the appearance bothers you, strain the cocoa through a fine sieve before pouring it into mugs to serve. 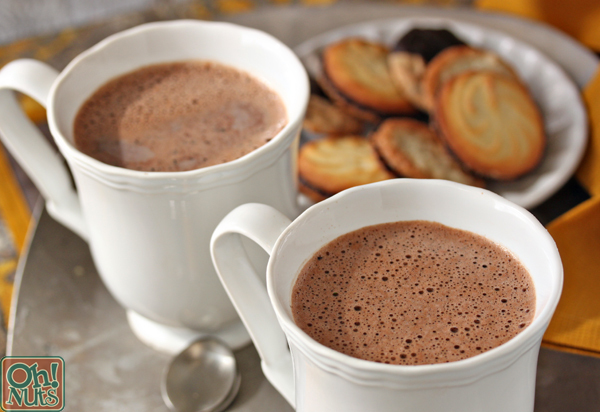 One of the best parts of this hot chocolate–aside from everything–is its unique texture. You know how, when you add marshmallows to hot chocolate, they eventually dissolve and leave a delicious foamy layer on top? This drink automatically has that creamy, bubbly, foamy layer of melted marshmallowy goodness! If you’re a lover of melted marshmallows in your drinks, you have to try this variation. This recipe can also be made with plain, untoasted marshmallows, so if you don’t have access to a torch or broiler, you can still enjoy marshmallow hot chocolate! 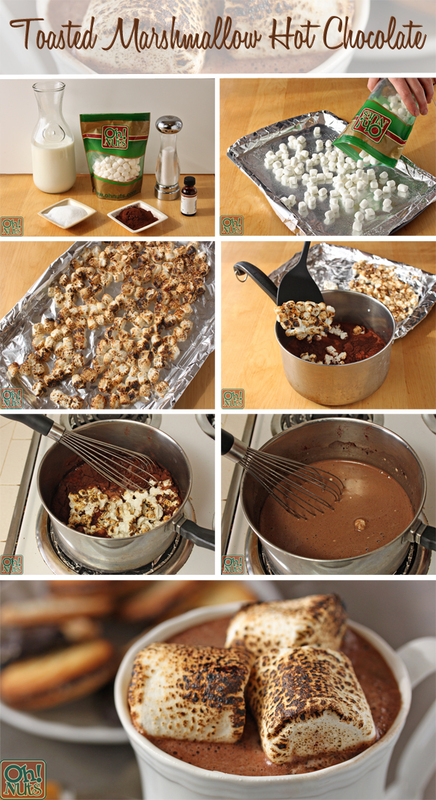 And hey, if you are able to toast marshmallows, why not try both variations and see which one you prefer? There’s no such thing as too much hot chocolate during winter! As always, an easily printable recipe and an easily pin-able image are down below. Enjoy! Cover a small baking sheet with foil, and spray it with nonstick cooking spray. Spread the marshmallows on the sheet in an even layer. If you have a kitchen torch, carefully torch the marshmallows until they’re evenly browned, with not much charring along the edges. (Some black spots are okay, but you don’t want them to be completely blackened.) If you don’t have a kitchen torch, turn on your oven broiler and place the tray of marshmallows on a rack about 6 inches beneath the broiler. Broil for 30-90 seconds, watching them carefully as they toast. The exact time needed will depend on your oven, and the marshmallows can go from “perfectly toasted” to “charred cinders” in the space of just a few seconds. Allow the marshmallows to cool briefly on the baking sheet. Combine the milk, cocoa powder, sugar, toasted marshmallows, vanilla, and salt in a medium saucepan. Place the pan over medium heat, and whisk occasionally as the mixture heats up. 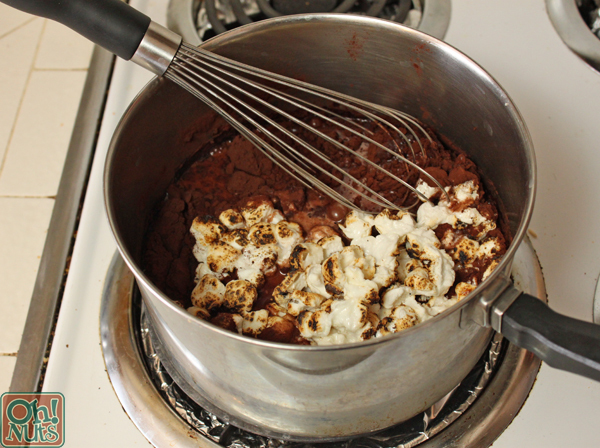 Whisk and heat until it is simmering and the marshmallows are completely dissolved. If you didn’t have many black areas on the toasted marshmallows, your cocoa should be ready to drink. If you did have a lot of charred areas, you may notice a few specks in the cocoa. These taste fine, but if the appearance bothers you, pour the cocoa through a fine sieve before pouring it into mugs to serve. 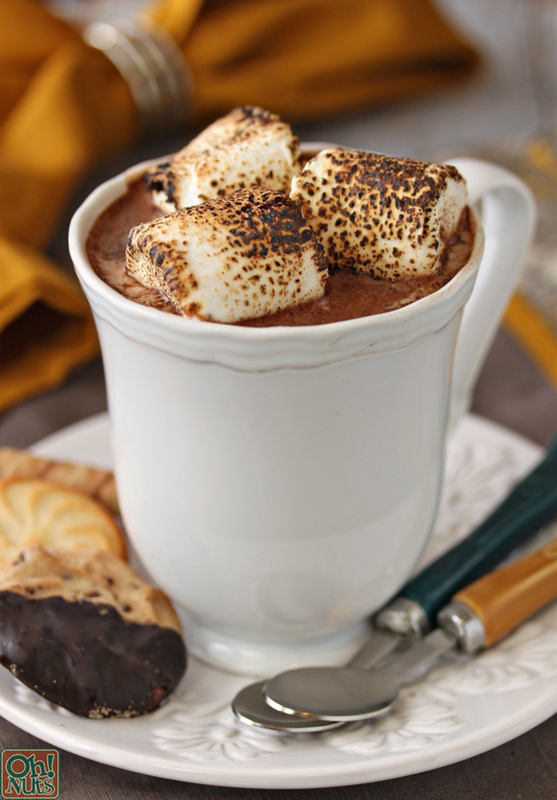 Serve Toasted Marshmallow Hot Cocoa topped with–what else?–toasted marshmallows! It can be made in advance and kept in the refrigerator for several days. Reheat in the microwave or on the stovetop to serve.